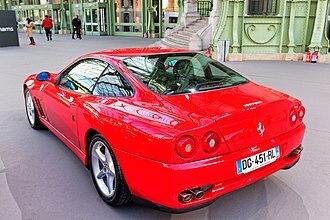 The Ferrari flat-12 engine family is a series of 180° V12 DOHC petrol engines produced by Ferrari from 1973 to 1996. Introduced with the 365 GT4/BB, this engine shared its construction with the flat-12 race-engines used in the 312B and 312 PB, but its displacement, bore & stroke, rods and pistons were the same as the Tipo 251 60° V12 Colombo engine powering the Daytona it replaced. 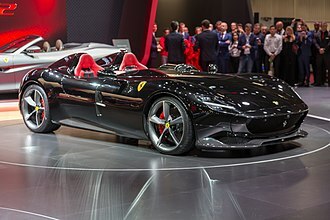 Design and development of the new engine was overseen by Ferrari engineers Giuliano de Angelis and Angelo Bellei. 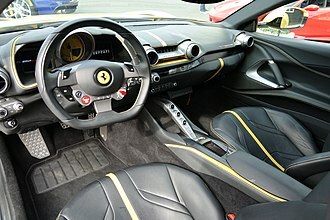 The engine was the first flat-12 cylinder configuration fitted in a Ferrari road car and had factory type reference F102A. 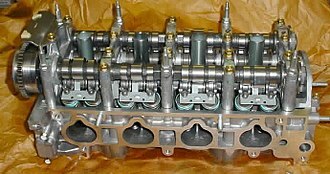 It had two valves per cylinder and twin overhead camshafts per bank, although these were now belt driven, instead of by chain as on earlier Ferrari 12-cylinder engines. It was fitted with two banks of two triple-choke Weber 40IF3C carburettors and an electronic ignition system. The block and cylinder heads were constructed from light alloy and featured wet sump lubrication. In 1976 Ferrari launched a revised version of the BB, the 512 BB, with a flat-12 engine enlarged to 4943cc. Named F102B, it featured a dry sump lubrication system to help the car scavenge oil. In 1981 the 512 BBi replaced the outgoing model’s four triple-choke carburettors with a Bosch K-Jetronic mechanical fuel injection. The new engine got factory type reference F110A but otherwise it was mechanically identical to its predecessor. With the debut of Testarossa in 1984, the evolution of the flat-12 engine saw it equipped with four valves per cylinder: with 390 PS (287 kW; 385 hp) it was the most powerful engine mounted on a production sports car at the time of its launch. It maintained the same cubic capacity of 4943cc of the 512 BBi model, and had factory type reference number F113A. It was fitted with a Marelli Microplex MED120 electronic ignition system and Bosch K-Jetronic fuel injection. Export versions for United States, Canada and Japan had catalytic converter and KE-Jetronic fuel injection. 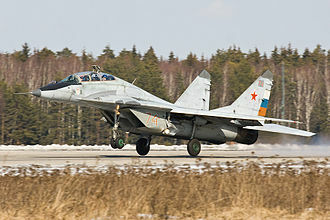 European versions got those features in 1986 and the revised engine was known as F113B. The 1991 512 TR had an upgraded version of the engine used in the Testarossa, maintaining the same cubic capacity of 4.9 L, and had factory type reference number F113D. Changes were made to the porting, with redesigned inlet plenums and larger valves providing more efficient fuel/air mix ingress, whilst the fuel injection and ignition system were changed to a combined Bosch Motronic M2.7 system. 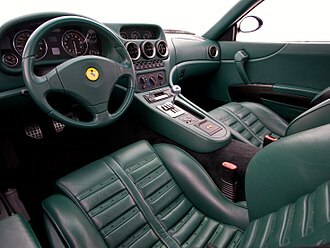 For the 1994 F512M the engine was further upgraded with a lightened crankshaft, titanium alloy connecting rods, new pistons and a stainless steel low backpressure exhaust system. 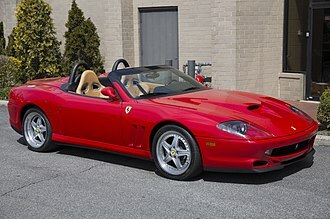 The flat-12 production ceased with the F512M, being replaced by the front-engined 550 Maranello which featured the new 65° V12 F133 engine. ^ "Ferrari 365 GT4 BB". Ultimatecarpage.com. Retrieved 13 June 2015. ^ a b "Velvet glove with knock-out punch: Berlinetta Boxer". The Auto Channel. Retrieved 13 June 2015. ^ "Ferrari 365 GT4 BB". Ferrari. Retrieved 13 June 2015. ^ "Ferrari 512 BB". Supercars.net. Retrieved 13 June 2015. ^ "Ferrari 512 BBi". Ferrari. Retrieved 13 June 2015. ^ a b "Ferrari Testarossa". Ferrari. Retrieved 13 June 2015. ^ "Testarossa versions". red-headed.com. Retrieved 13 June 2015. ^ "Ferrari 512 TR". Ferrari. Retrieved 13 June 2015. ^ "Ferrari F512M". Ferrari. Retrieved 13 June 2015. ^ Ferrari 365 GT4 BB Instruction Book. Ferrari. 1973. ^ Ferrari BB512 Instruction Book. Ferrari. 1980. ^ Ferrari BB512i Owner's Manual. Ferrari. 1981. ^ Ferrari Testarossa Owner's Manual. Ferrari. 1985. ^ Ferrari Testarossa U.S. version Owner's Manual. 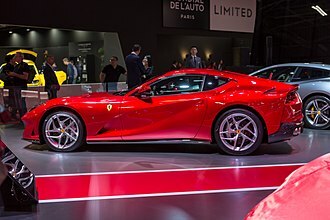 Ferrari. 1985. A catalytic converter is an emissions control device that converts toxic gases and pollutants in exhaust gas to less toxic pollutants by catalyzing a redox reaction. 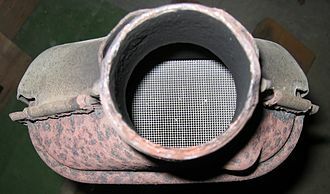 Catalytic converters are used with internal combustion engines fueled by either petrol or diesel—including lean-burn engines as well as kerosene heaters, the first widespread introduction of catalytic converters was in the United States automobile market. These two-way converters combined oxygen with carbon monoxide and unburned hydrocarbons to produce carbon dioxide, in 1981, two-way catalytic converters were rendered obsolete by three-way converters that reduce oxides of nitrogen, two-way converters are still used for lean-burn engines. This is because three-way-converters require either rich or stoichiometric combustion to successfully reduce NOx and they are used on some wood stoves to control emissions. This is usually in response to government regulation, either through direct environmental regulation or through health, the catalytic converter was invented by Eugene Houdry, a French mechanical engineer and expert in catalytic oil refining, who moved to the United States in 1930. Houdry first developed catalytic converters for smoke stacks called cats for short, in the mid-1950s, he began research to develop catalytic converters for gasoline engines used on cars. He was awarded United States Patent 2,742,437 for his work, widespread adoption of catalytic converters did not occur until more stringent emission control regulations forced the removal of the anti-knock agent tetraethyl lead from most types of gasoline. Lead is a catalyst poison and would disable a catalytic converter by forming a coating on the catalysts surface. 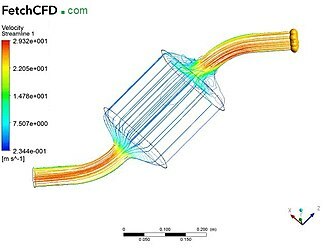 Pfefferle developed a catalytic combustor for gas turbines in the early 1970s, allowing combustion without significant formation of nitrogen oxides, the catalytic converters construction is as follows, The catalyst support or substrate. For automotive catalytic converters, the core is usually a ceramic monolith with a honeycomb structure, metallic foil monoliths made of Kanthal are used in applications where particularly high heat resistance is required.